A sprain is an injury that damages a ligament. Ligaments are strong bands of tissue that connect bones to each other. 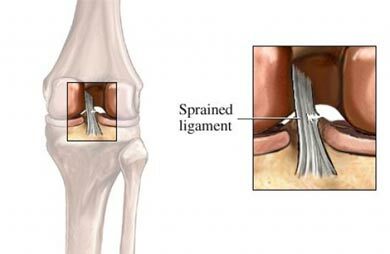 A sprain is when a force pushes the bones of a joint apart. If the force is strong enough, the ligament comes apart. Elevation will help reduce swelling. Compression with an elastic bandage also helps control it. Ice may help reduce swelling and pain in the first few days after you are hurt. After a couple of days, heat may help loosen tight or injured muscles. Wait for swelling to go away before using heat. Rehabilitation exercises may be helpful after the sprain heals. Exercises can help make muscles stronger and increase range of motion. Medical help is often needed at this stage. It is important to strengthen the muscles where the ligament is. Those muscles need to be protected against further injury. Use proper techniques to help avoid awkward motions and missteps. Do flexibility, strength, and fitness training. Ankle sprain. EBSCO DynaMed Plus website. Available at: https://www.dynamed.com/topics/dmp~AN~T113633/Ankle-sprain . Updated April 30, 2018. Accessed June 11, 2018. Sprained ankle. Ortho Info—American Academy of Orthopaedic Surgeons website. Available at: http://orthoinfo.aaos.org/topic.cfm?topic=A00150. Updated February 2016. Accessed June 11, 2018.